If your files contain JPEG or JPEG-2000 images, you may see this memory warning even if your file size is smaller than the amount of allocated memory. This is because compressed images like JPEG need to be decompressed into memory before being displayed and require more memory than their file size suggests. If you are having this issue, try utilizing one of the memory management tools below. Data Browser is another part of Bio-Formats that enables users to view large 3, 4, or 5-D datasets by caching a subset of all the images available. This enables users to view a stack that is bigger than the computer’s memory. You can select Data Browser as an option for View stack with, the leftmost, uppermost option in the Bio-Formats Import Options screen. Note that when you use Data Browser, other features like cropping and specifying range are not available. You can, however, adjust the size of the image cache in the Data Browser after you open the files. You can read more about it on LOCI’s Data Browser page. Crop on Import is useful if your images are very large and you are only interested in one specific section of the stack you are importing. If you select this feature, you will see a screen where you can enter the height and width (in pixels) of the part of image you want to see. Note that these measurements are from the top left corner of the image. The Specify Range for Each Series option is useful for viewing a portion of a data set where all the plane images are encapsulated into one file (e.g. the Zeiss LSM format). If your file has a large quantity of images, you can specify which channels, Z-planes, and times you want to load. Virtual Stack conserves memory by not loading specific images until necessary. Note that unlike Data Browser, Virtual Stack does not contain a buffer and may produce choppy animations. 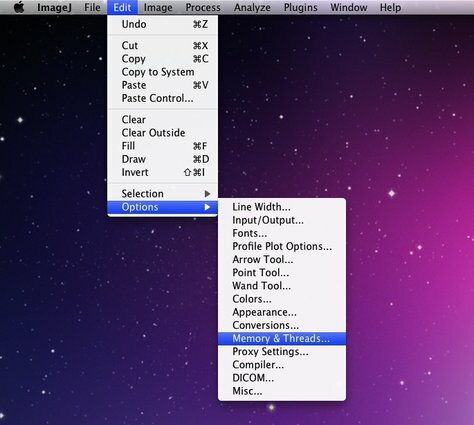 Finally, you can also increase the amount of the computer memory devoted to ImageJ/Fiji by selecting Memory & Threads under the Edit menu. Generally, allocating more than 75% of the computer’s total memory will cause ImageJ/Fiji to become slow and unstable. 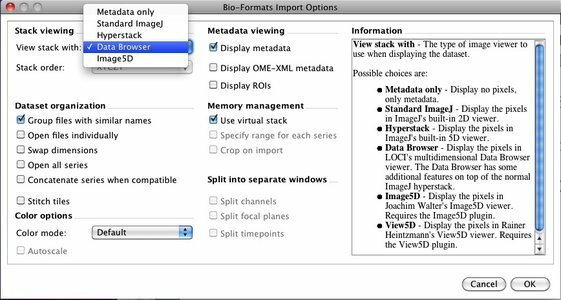 Please note that unlike the other three features, ImageJ/Fiji itself provides this feature and not Bio-Formats. You can find out more about this feature by looking at ImageJ’s documentation.